Many of today's graphic designers, for reasons of both economics and personal gratification, are stretching the borders of their practice by assuming the role of strategists who can advise on, and exert control over, a client's total design needs. This notion of the graphic designer as wide-ranging generalist is hardly new. Back in the '30s, '40s, and '50s, when graphic design was establishing its footing in the business world, its leading practitioners could well ask themselves: Why do one job when you could make a real difference by doing every job? They felt that involvement in the total design effort ensured perfection, whereas piecemeal involvement invited dissatisfaction. To that end, designers like Paul Rand, Erik Nitsche, and Alvin Lustig made a point of working with clients who wielded power and influence and didn't pigeonhole them, but rather, as like-minded visionaries, accepted their assessment of themselves as renaissance men. 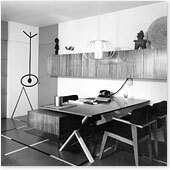 Lustig (1915-1955), a modern-design pioneer, particularly inveighed against professional categorizing. 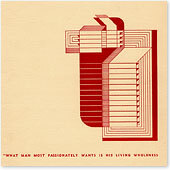 "The words 'graphic designer,' 'architect,' or 'industrial designer' stick in my throat giving me a sense of limitation, of specialization within the specialty, or a relationship to society that is unsatisfactory and incomplete," he wrote, about his brief yet variegated career, in the September 1946 Interiors. "This inadequate set of terms to describe an active life reveals only partially the still undefined nature of a designer." He felt that life was too short for such compartmentalization; by age 39 he had gone blind from diabetes, and a year later, he died. Perhaps knowing that his time was limited forced Lustig to excel in many design disciplines and pack a lifetime of experience into half a lifespan. Lustig proclaimed that he was a charter member in the "younger group that was born modern," for whom design was not a job but a calling. He held the rather messianic belief that anything a modern designer laid hands on - from a book cover to a room interior - would benefit the world. He ignored design boundaries; when clients or friends would innocently ask his advice about, say, which lamp to purchase for their office or home, he would reply, "I won't recommend a lamp, but I will redo the entire room" - even though he never formally studied architecture or interior design. He did, however, attend Art Center School in Los Angeles in 1934 for a year, where he absorbed modernist theories. The following year he joined Frank Lloyd Wright and his followers for further indoctrination at Taliesin East in Wisconsin. 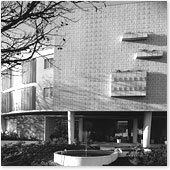 However, he grew weary of sitting at the master's feet, and after three months of the kowtowing required of Wright acolytes, Lustig returned to L.A. without the architectural wisdom he had sought. Conversely, his friendship with California architect Richard Neutra gave him unlimited access to an extensive library of books and magazines on modern architecture and design, which profoundly influenced his practice. 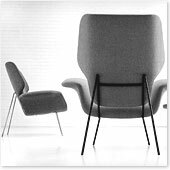 He drew inspiration as well from Franco Albini, one of the pioneers of modern Italian furniture design, and later from architect Philip Johnson, who became his friend and referred clients to him. Even more significant was his natural affinity for architecture and his innate ability to conceive in three-dimensional space. With his instincts and acquired knowledge, Lustig showed a high degree of self-taught proficiency in furnishing and decorating his own studios in Los Angeles and New York. From these self-commissioned jobs and a personal charisma, he built a practice designing apartments, offices, and stores. For 15 years, from the late 1930s to the early 1950s, Lustig designed several dozen interior spaces, as well as chairs, tables, cabinets, lamps, rugs, and textiles used to appoint these rooms. He sketched out his ideas while craftsmen fabricated them, and some of his chairs and textiles were commercially produced and sold in modest numbers. Although the interior work has been eclipsed in design histories by his graphics, during the '40s and '50s Lustig's interiors, including his own studios, were featured in leading architecture magazines, notably Interiors, whose editor, Olga Gueft, was awed by his charm and talent. Photographs from these articles offer a glimpse into how Lustig's three-dimensional esthetic informed his two dimensional sensibility, and vice versa. Lustig would often comment that the places where people worked are as revealing as how people worked, and that a smart interior separates truly creative people from the less imaginative. This is one reason why his studios exhibited a modernist preference for functional economy; another was that his limited cash flow prevented him from renting more than two or three relatively small rooms. These studio spaces typically accommodated Lustig and his wife, Elaine (who from 1948 until 1955 worked as his office manager before becoming an accomplished graphic designer in her own right), along with two or three design assistants. Using transparent materials in open spaces, Lustig made maximum use of the proscribed space he had. Each of his studios was selectively filled - edited - with objects that best illustrated a modern spirit; a few of them - a figurine of an Aztec god, a steel boat propeller, a bulbous glass jug - accompanied him to all his spaces. Ivan Chermayeff, who worked for Lustig before and after he became blind, recalls that his Manhattan office was "clean as a whistle, very small, very ethereal, and very modern." But, Chermayeff adds, it was also very formal, as the design was "more about stuff than space - picking a lamp or a desktop" rather than building an architectural environment. In fact, Lustig was prohibited by the building's owners from making structural improvements, so he devised imaginative means to divide space - such as hanging a white wooden blind from the ceiling to separate reception from work areas while allowing for transparency, and using a simple beaded curtain suggesting fluidity to replace the door to the storeroom. 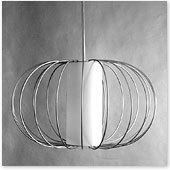 Lustig also designed sculptural lighting fixtures with small circular bulbs that were akin to the abstract linear designs he used on some of his better-known book jackets. He hung floor-to-ceiling curtains made from Ninon, an inexpensive white transparent nylon fabric, to smooth out the edges of the room. "It was "all very chic," Chermayeff says, as well as practical. Every ornamental indulgence had utilitarian logic. 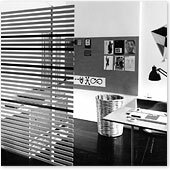 The stark wood slats on the wall of his Los Angeles studio on the Sunset Strip in 1946 served double duty as a clever display system (with hidden mounts) on which to hang book jackets and advertisements and a wall decoration. 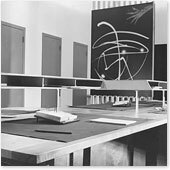 Similarly, his cantilevered desk (inspired by Albini) functioned both as a desk and as a compelling object that seized the eye. Salt-and-pepper carpeting provided extra texture and color, while ubiquitous Mexican straw baskets were a counterpoint to modernist purity. Lustig's studios and their furnishings were as meticulous as he was; the white marble desktop in his New York studio never bore more than a pad, pencil, triangle, and scissors. Elaine Lustig Cohen recalls that he sketched precise thumbnail ideas on tracing paper and then passed them on to other facilitators. Chermayeff says, "We would have to go into his office to present work, he never walked into ours," and he would review all work closely, making certain that everything he had designed was precisely followed through. Lustig was born in Denver and grew up in Los Angeles, where his father worked in the film industry. Perhaps it was the show-business ambience, but as a teenager Lustig developed a talent for making puppets and staging magic shows. By 16, he had membership in the International Brotherhood of Magicians, and obtained regular bookings at parties and other events. But he soon found he was spending more time designing posters for his act than developing feats of magic for it and his high school art teacher introduced him to the posters of A.M. Cassandre and E. McKnight Kauffer, as well as to modernist architecture. "From that moment my way of seeing was transformed," Lustig once wrote. In fact, he designed his first interior while still in high school. He repainted his bedroom walls in black, white, and rust. His sister, Susan Lustig Peck, recalls, "In a neighborhood where the favored color was taupe, the room was electrifying, and people came from blocks around to see it." Immediately after graduating high school in 1933, the 18-year-old Lustig landed a job as art director of Westways, the magazine of the Automobile Club of Southern California. Although this was an astonishing accomplishment for one so young, after a few months he realized that his design education was far from complete and he quit his job to enroll at Los Angeles Junior College. There, he took a printing and type course with printer Richard Hoffman. At the time, he was also smitten by the look of the new modern homes in the Silver Lake district of Los Angeles designed by Richard Neutra. 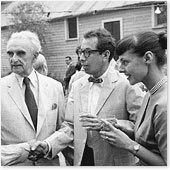 On impulse, Lustig telephoned Neutra, expressing his admiration and explaining that he was interested in modern art and architecture but could not find books on the subject. Charmed by Lustig's forthrightness, Neutra gave the young man access to his personal library. Lustig enrolled in the Art Center School in 1934 because it had the best technical faculty on the West Coast. Wanderlust overtook him, however, and in 1935 he did a three-month stint at Taliesin East. Though disappointed by the overall experience, he was sufficiently impressed by Frank Lloyd Wright's colored-pencil sketches for stained glass windows, which had a typographic feeling, to begin his own typographic experimentation. Back in L.A., Lustig happened into a bookshop designed by Wright and owned by Jacob Zeitlin, to whom he showed his portfolio. Impressed with Lustig's novel illustrative-type treatments, Zeitlin commissioned him to do a Christmas card that was printed by Ward Ritchie, a fine-book printer and publisher. 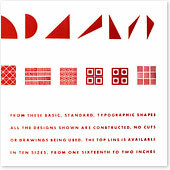 Ritchie, in turn, was excited by Lustig's typographic experimentation and encouraged him to design books. In 1937 Lustig earned enough money to pay for a modest studio in L.A. that, Ritchie later recalled in a letter to Elaine Lustig Cohen, was "a formerly dull room he'd rented in a building on West Seventh Street.... When his landlord saw how he'd transformed the murky back room into a handsome studio he decided that the rent was too low and doubled it, which was more than Alvin was willing to pay. I offered him space in our printing shop rent-free. Typically, he redesigned my office, making it functional, forthright and attractive." 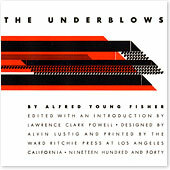 In this office, Lustig produced some of his most novel experimental "typecase pages," using geometrical printer's ornaments, rules, and furniture as abstract illustrations, notably for Ward Ritchie's Ghost in the Underblows by Alfred A. Fisher and Robinson Jeffers by William van Wyck. He soon became a sought-after book designer. In 1940 he moved out of Ritchie's shop into a small studio behind a drugstore in downtown L.A.'s Barrington Court, where he designed and printed letterheads and booklets while experimenting with designs for prefabricated furniture and modular constructions. That year, Zeitlin introduced Lustig to James Laughlin, legendary publisher of New Directions, who commissioned him to design book jackets. The first one he did, for Henry Miller's Wisdom of the Heart, was in his typecase style, but he soon began experimenting with photomontage and abstract imagery on jackets that later became classics. In 1943 Lustig designed a new L.A. studio, where the Aztec god figurine made its first appearance. The appointments for this studio included floor-to-ceiling drapes opposite a brick fireplace that created the illusion of space in confined quarters. A dark floor with lighter throw rugs made the ceilings appear higher. The overall effect was of a living room rather than a workroom, which, for Lustig, were one and the same. The artfully abstract and symbolic covers produced for New Directions defined the publisher's identity (and, according to Laughlin, doubled sales of the books), while also setting the standard for book-cover design. But the always restless Lustig was not content with this work alone, and in 1944 he moved lock-stock-and-Aztec-god to New York to become visual research director for Look magazine. He was guaranteed the right to design the new offices for his department and also art directed Staff, the in-house publication. At this time Lustig was working with what he called a "fluid environment." Unlike traditional offices in this moderne Madison Avenue building, with their blocky wood desks, high-back upholstered chairs, and imposing hardwood bookcases, the Lustig-designed offices contained furniture in softer looking woods with thin legs to give the impression of floating on air. Photographs by Maya Deren show an open space free from conventional dividers and other compartmental encumbrances. 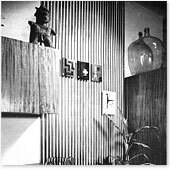 Lustig further played with "dissimilarity": Glass tables and vases contrasted with light and dark wood surfaces; open shrives contrasted and alternated with closed cabinets; dark wood panels on which lights were hung from the ceiling contrasted with the light painted walls, which further varied in color from wall to wall. Even a photogram that hung in the main work area was a blend of contrasting abstract forms. Everything about the office symbolized the creative process. Lustig left Look after two years and returned to Los Angeles to open a new Sunset Boulevard studio that expressed his immersion in modern art. His workroom was an array of harmonious modernist forms: The desk had cantilevered drawers that appeared to hang from space, and the chairs conveyed a futuristic, streamlined esthetic. The floor was a grid reminiscent of a de Stijl painting, with alternately colored intersecting lines that echoed the linearity of the design on the back wall, which was composed of parallel lines interrupted by a dark panel marked with numerical measurements. On the opposite white wall, an enlargement of one of Lustig's signature glyphs contrasted with a small African fertility god, the omnipresent Aztec god, and a few Mexican straw baskets. 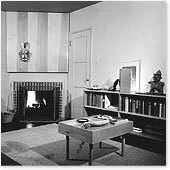 Lustig's affinities are also revealed on the bookshelves, which displayed books on Moholy-Nagy and Le Corbusier, plus some devoted to his favorite artists, such as Pablo Picasso and Henry Moore, who along with Paul Klee and Joan Miro influenced the textiles he was designing for commercial use (including Incantation, produced by Laverne Originals). During this final California period, Lustig's interior commissions increased. With architect Sam Reisbord, he designed the Beverly Carlton Hotel, a luxury apartment house, and a school and community center for the Zionist labor movement. He also designed L.A.'s chic Sheela's shoe store. But the work was sporadic and cash flow remained a problem - the California design commissions simply could not support the Lustigs. So they returned to New York in 1951, and a year later opened the East 58th Street office, where for the next two years he worked for such clients as Alfred Knopf, United Productions of America, Lansing Sound, New Directions, Meridian Books, and Noonday Press. He also became a visiting critic in design at Yale University and helped develop its graduate program. Following the onset of blindness in 1954, Lustig continued to acquire new clients, some of whom did not know of his a affliction. Ivan Chermayeff recalls, "He sat behind his marble desk and literally scanned a design across his mind's eye, going from top to bottom, and then verbally transcribed every last detail from minute typographic placement to color specification." Throughout his brief professional life, Lustig pursued his determination not to be compartmentalized. However, design history seems to have done precisely that. In his messianic way, Lustig saw himself as an instrument of a better world, which, he felt, demanded that he immerse himself in the entire design process. He died at 40, leaving a legacy of justly celebrated graphic design, but also a formidable body of interior design, arguably as significant, and largely overlooked.